48 • ROCK products • July 2018 www.rockproducts.com COMMUNITY RELATIONS Thomas J. Roach Ph.D., has 30 years experience in communication as a jour- nalist, media coordinator, communication director and consultant. He has taught at Purdue University Northwest since 1987, and is the author of "An Interviewing Rhetoric." He can be reached at thomas- jroach@gmail.com. Opinion leaders are people who influence the opinions of others. Celebrities are opinion leaders on cultural issues. However, when it comes to business issues and politics the most influential opinion leaders are people we know. We listen to them because they have some recognizable exper- tise. For instance, voters who know police officers or attorneys are likely to ask them who they think they should vote for in elections for sheriff, state attorney or circuit court judge. Two-Step Flow Communication researchers following political issues came up with the two-step flow theory in the 1950s to describe how some members of a community act as receptacles and conduits for distributing information and opinions to others. The opinion leader in a small community may subscribe to news magazines and read books about current events and provide insights and arguments for others who do not access the primary sources. Editorial writers often write their argu- ments for these opinion leaders knowing that the opinion leaders will disseminate their ideas to a larger audience. The original studies on two-step flow were based on inter- views with people in small Mayberry-like communities like Decatur, Ill. They found people functioning as opinion leaders at gathering places like the barber shop or beauty salon. Today many of the people who influence our opin- ions are online, and marketing professionals identify and use these online opinion leaders to promote their products and services. 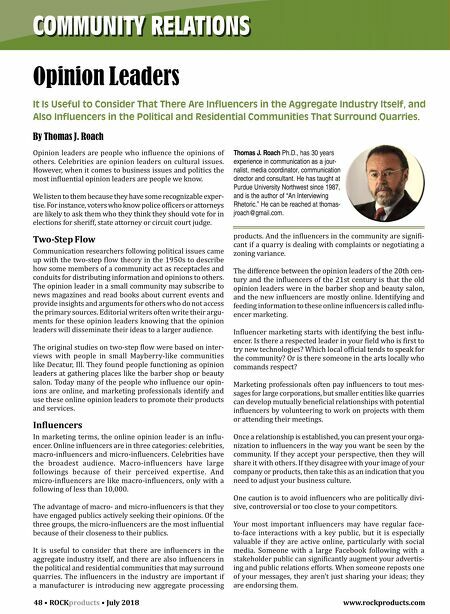 Influencers In marketing terms, the online opinion leader is an influ- encer. Online influencers are in three categories: celebrities, macro-influencers and micro-influencers. Celebrities have the broadest audience. Macro-influencers have large followings because of their perceived expertise. And micro-influencers are like macro-influencers, only with a following of less than 10,000. The advantage of macro- and micro-influencers is that they have engaged publics actively seeking their opinions. Of the three groups, the micro-influencers are the most influential because of their closeness to their publics. It is useful to consider that there are influencers in the aggregate industry itself, and there are also influencers in the political and residential communities that may surround quarries. The influencers in the industry are important if a manufacturer is introducing new aggregate processing Opinion Leaders It Is Useful to Consider That There Are Influencers in the Aggregate Industry Itself, and Also Influencers in the Political and Residential Communities That Surround Quarries. By Thomas J. Roach products. 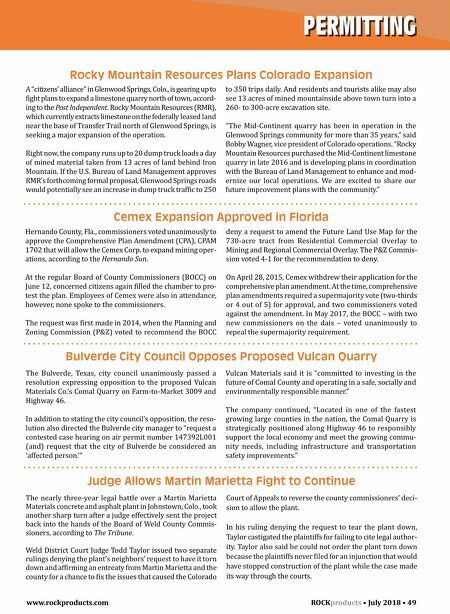 And the influencers in the community are signifi- cant if a quarry is dealing with complaints or negotiating a zoning variance. The difference between the opinion leaders of the 20th cen- tury and the influencers of the 21st century is that the old opinion leaders were in the barber shop and beauty salon, and the new influencers are mostly online. Identifying and feeding information to these online influencers is called influ- encer marketing. Influencer marketing starts with identifying the best influ- encer. Is there a respected leader in your field who is first to try new technologies? Which local official tends to speak for the community? Or is there someone in the arts locally who commands respect? Marketing professionals often pay influencers to tout mes - sages for large corporations, but smaller entities like quarries can develop mutually beneficial relationships with potential influencers by volunteering to work on projects with them or attending their meetings. Once a relationship is established, you can present your orga- nization to influencers in the way you want be seen by the community. If they accept your perspective, then they will share it with others. If they disagree with your image of your company or products, then take this as an indication that you need to adjust your business culture. One caution is to avoid influencers who are politically divi- sive, controversial or too close to your competitors. Your most important influencers may have regular face- to-face interactions with a key public, but it is especially valuable if they are active online, particularly with social media. Someone with a large Facebook following with a stakeholder public can significantly augment your advertis- ing and public relations efforts. When someone reposts one of your messages, they aren't just sharing your ideas; they are endorsing them.